I used to be a huge Goth. Black lipstick, platform new rocks, dyed black and pink hair, black nails... truth is I've never really grown out of it but my style has calmed down an awful lot. Since having a baby however I'm finding my old style ways slipping back into my life and I'm kinda loving it. My old job meant I couldn't dress exactly how I wanted too. I used to work for a council in London and was quiet high up in the Library ranks. I dealt a lot with suppliers and had to do site visits so I couldn't get away with wearing what I would have liked too and due to this I think I slipped into a 'style' that still nodded to me but was more workplace appropriate. 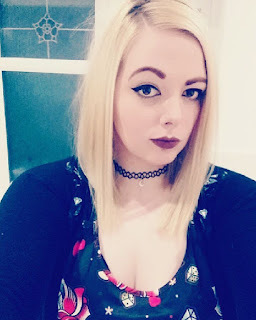 I still mainly work black, but I opted for more dresses, leggings, pumps and the probably biggest transitional for me was actually leaving the jet black hair behind and going totally blonde. As the years went by I found my wardrobe actually having a few colours in, the dresses becoming lighter and the shoes becoming brighter. Since I left my old job and had a baby I no longer have to worry about looking workplace appropriate as currently I'm a stay at home mum. So I've found my old ways starting to slip back in and I'm totally feeling it! The new band shirt trend is filling me complete and utter joy as over the years my band shirts have met their demise and it's the utterly perfect time to stock up. I used to live in cut up band shirts and jeans so I'm really pleased their back! I now wear my band shirts with blue or black distressed skinny jeans and slip on shoes or Creepers. My old work dresses still totally work for my style as the majority of them are black or another colour with some kinda of print on. I adore my black ones with white collars and my gorgeous Sourpuss skater dresses too. My old blazers still work really well too as they help give my alternative look a more grown up feel (I mean I am someones Mum now!). Shoe wise I'm totally back into my slip on shoes, black wedges, platforms and Creepers. I'm currently living my life in my Hotter Shoes leopard print slip ons or my Minnie Mouse slip ons but on nights out I keep reaching for my very lovely platform Creepers which instantly make me feel 18 again. My hair is still blonde, I don't think I'm feeling doing anything utterly drastic yet...... (I have plans!) but I have added a good old pink flash to one side which I'm loving. 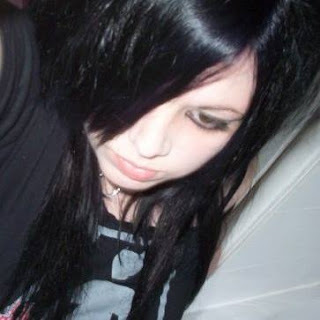 I always used to have some sort of mad colour in my hair but alas my work wouldn't allow me to have unnatural coloured hair! I'm getting back into big hair too, backcombed, bandana's and curls are all things I used to spend hours perfecting and while I haven't got the time anymore, a version of them are back. I'm super happy rediscovering my old style and the old me. I do feel like I might have lost that side of me and it's lovely to be able get back in touch, I'm even starting to dig out old albums and I really want to go to a festival again. 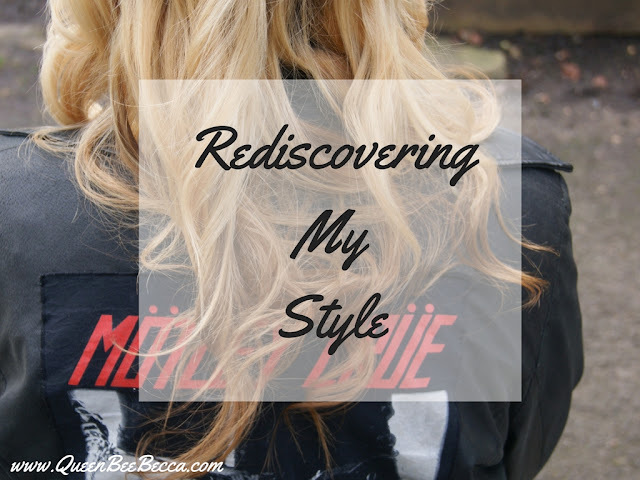 Have you ever rediscovered a style you used to wear and fallen in love all over again? This is a very interesting story. When I was in school I used to put on black, silver or even green lipstick, wear massive military boots and all sorts of dark clothes. Obviously, some 15-20 years later I have changed significantly and my style and personal preferences have moved on. I do like wearing lots of monochromes and dark clothes, but I think it's more for a clean and minimalist style rather than goth. I think it's sometimes easy to 'loose' part of your style when you start work, but even more so after having a baby. I struggled finding my way with mine, although I had no set style, like yourself, after having a baby I just couldn't find what I liked anymore. However, I think that's sometimes the issue. It's ok to not have a set style. I filter some days between trainers and ankle boots. Though I'm always in jeans. But also, I think I struggled a lot with body confidence. I didn't feel i looked or suited certain clothes, rather than wearing the because I liked them. I have over time found that I'm not great with patterns. Or too much pattern.